Spring and summer might be prime time for fruit salad, but the fun doesn't have to stop there. 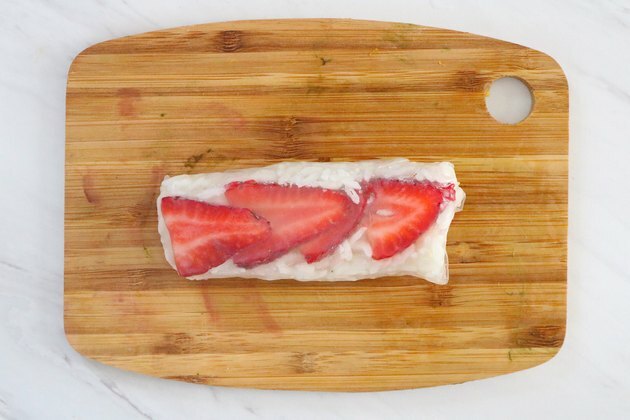 These fruit spring rolls are a delicious way to enjoy the best produce of the season. They are also full of coconut rice, so you can be sure that this healthy treat will leave you feeling satisfied. 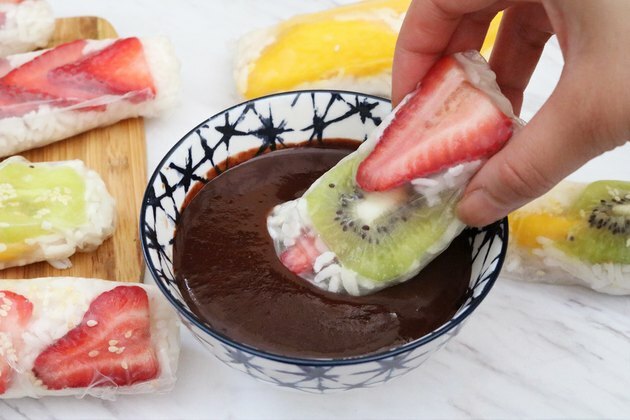 Top things off with a chocolate dipping sauce and you've got yourself a refreshing, sweet, and photogenic dessert. Ready to make them yourself? Here's how. 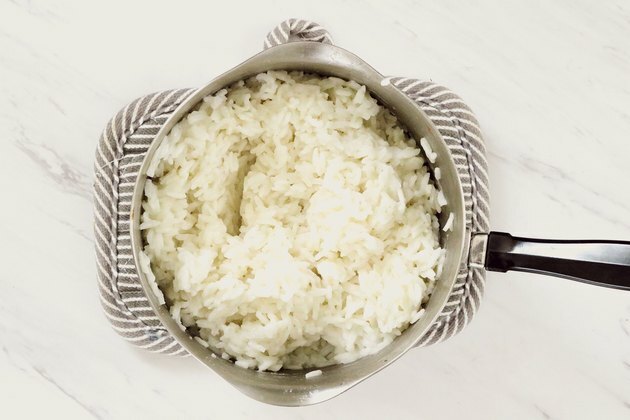 This recipe yields 3 cups of cooked rice. To make a larger serving, use 2 cups liquid for every 1 cup of uncooked rice. 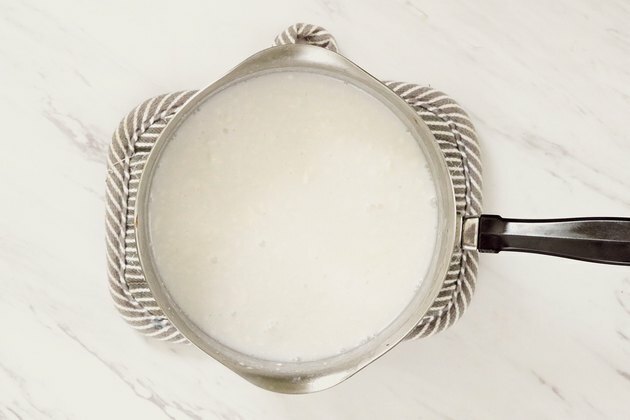 In a small pot, combine the coconut milk, rice, and sweetener. Mix well and bring to a boil. Reduce to a simmer and cook for 20 minutes, stirring frequently. The rice should be sticky but not wet. If there is some liquid left, gently cook for a few more minutes. When it comes to fruit, anything goes. Use your favorite or whatever is in season. For reference, this recipe used 1 kiwi, 1/2 mango, and 4 strawberries. 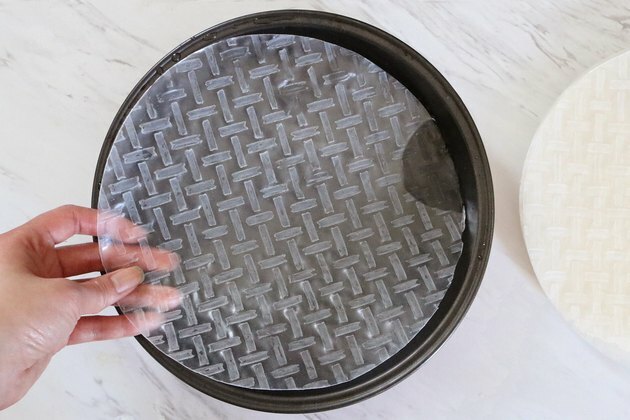 Fill a pie pan with warm water. 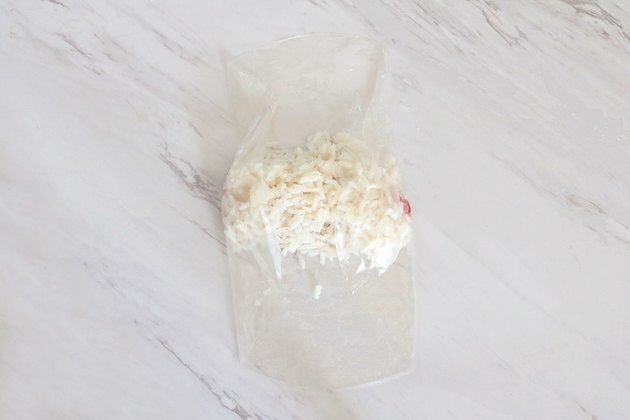 Briefly dip a rice paper wrapper in the water and place on a dry surface, such as a clean counter top or cutting board. Let sit for a few seconds. The rice paper will become translucent and pliable. If using sesame seeds, sprinkle them on first. 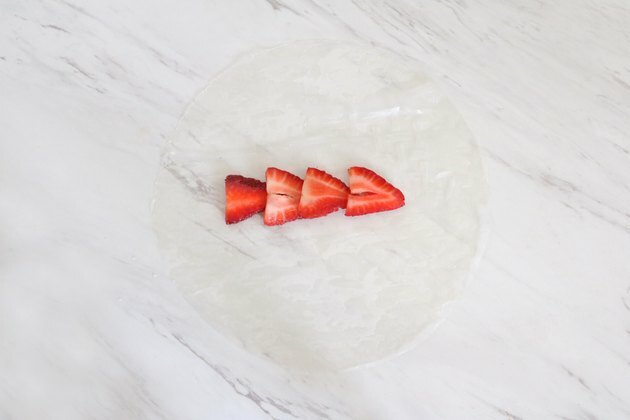 Place 3 to 4 slices of fruit in the center. If parts of the wrapper dry out, dip your fingers in water and gently dampen the area. This will minimize tearing. 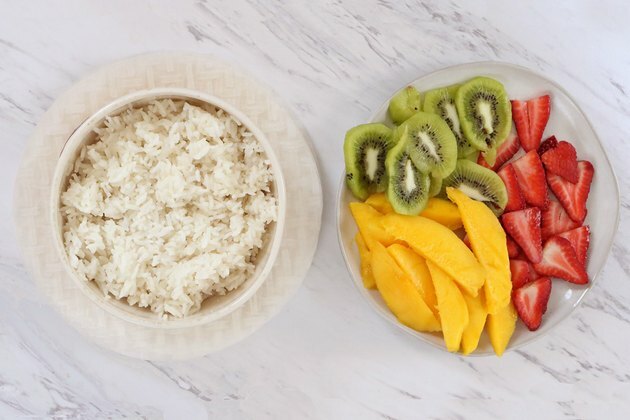 Add 3 to 4 tablespoons of coconut rice. Make sure the filling is about 1 1/2 to 2 inches from the edges. Fold each side of the wrapper inward, much like you would with a burrito. Fold up the bottom half of the wrapper, tuck under the fillings, and roll shut. Set aside to dry slightly. Repeat with the remaining rice paper wrappers, fruit, and rice. While constructing the spring rolls, melt the chocolate for the dipping sauce. You can also make the sauce while the rolls dry. 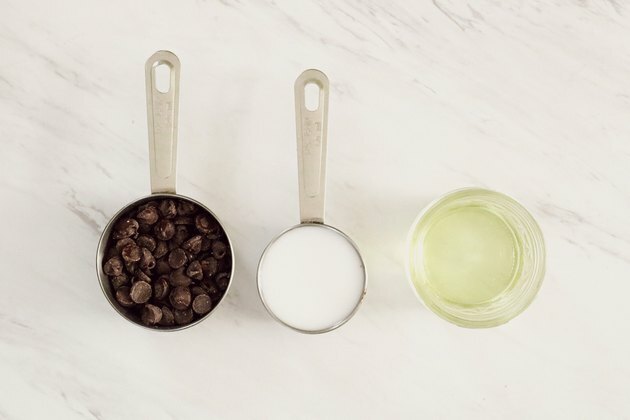 Before starting, create a double boiler. Simply fill 1/3 of a small pot with water. Lay a slightly larger stainless steel bowl on top of the pot, making sure that the bottom does not touch the water. You can also place a heat-safe measuring cup or mason jar in the pot of water. 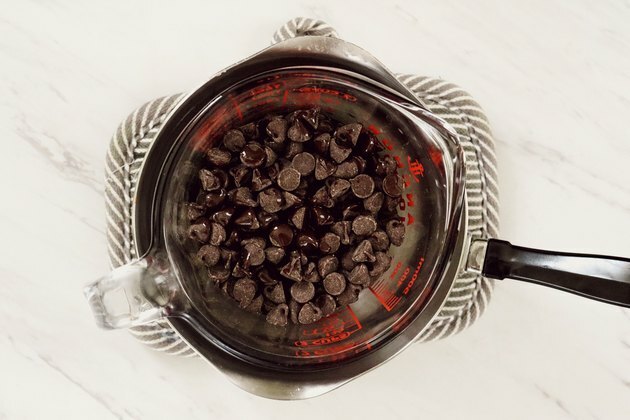 In the stainless steel bowl or heat-safe cup, combine half the chocolate chips and half the oil. Slowly heat the water so that it is steaming, but not bubbling. Keep a close watch and stir frequently. 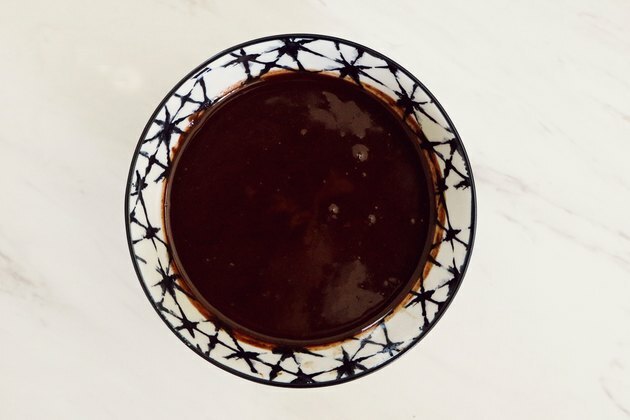 Once the chocolate has liquefied, add the remaining chips and oil. Mix until everything has melted and the chocolate reaches a smooth, even consistency. Do not do this step without water. This is especially important if you are using a mason jar, which will break when heated in a pot by itself. While the melted chocolate is still warm, stir in the milk until thoroughly combined. Pour into a small bowl. If chocolate isn't your style, use butterscotch or caramel chips instead. Want a low-sugar option? Whip up a half portion of your favorite smoothie and serve it as a dip. Yogurt, honey, and whipped cream cheese work just as well. This recipe makes enough for 7 to 8 spring rolls, depending on how much you stuff each one. 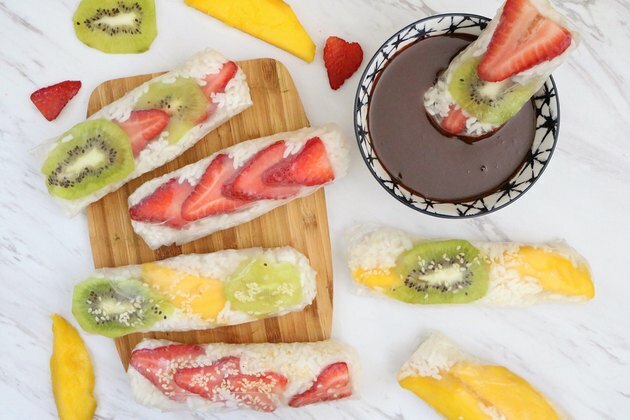 To make enough for a party, simply double or triple the coconut rice, fruit, and chocolate dipping sauce as needed. How Is Peanut Butter Pasteurized?